One thing I never really experienced growing up in the flat plains of Wisconsin was breathtaking mountain views. It’s also something I haven’t really been able to experience in Tajikistan either. Even though the country is overwhelmingly mountainous, it’s hard to see in them in their splendor in Dushanbe. The air quality is bad, particularly in the winter, and so any glimpses you can get are fleeting. This especially frustrates me in the winter when beautiful snow-capped mountains loom just out of eyes reach. Of course, you can see them if you get out of the city, but we haven’t had a free weekend in months to manage it. You also can’t really ski here. The closest spot is an hour away, and from what everyone has told me it’s small, basic, and kind of dangerous. 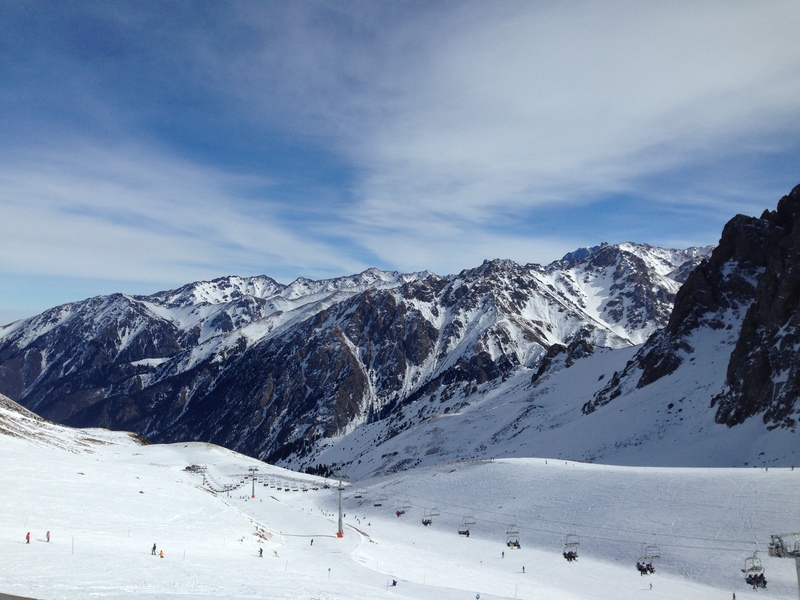 Our best bet for some decent skiing was outside Tajik boarders. One of the beautiful things about my job is I can organize events that are somewhat self-serving. You mean to tell me there’s a good ski resort in Almaty, Kazakhstan that’s an easy two hour flight that doesn’t leave in the middle of the night? AND! If I get at least a few people from the Embassy together, I can go as CLO and get paid?? SIGN ME THE EFF UP. This event was my first CLO baby. I took the lead in planning, and the lead in worrying. I was a nervous wreck the week leading up the trip that I’d forgotten something, or that the resort wasn’t as nice as they said, or that someone would injure themselves on the slopes leading to a medevac. My imagination ran wild – and it was all for naught. 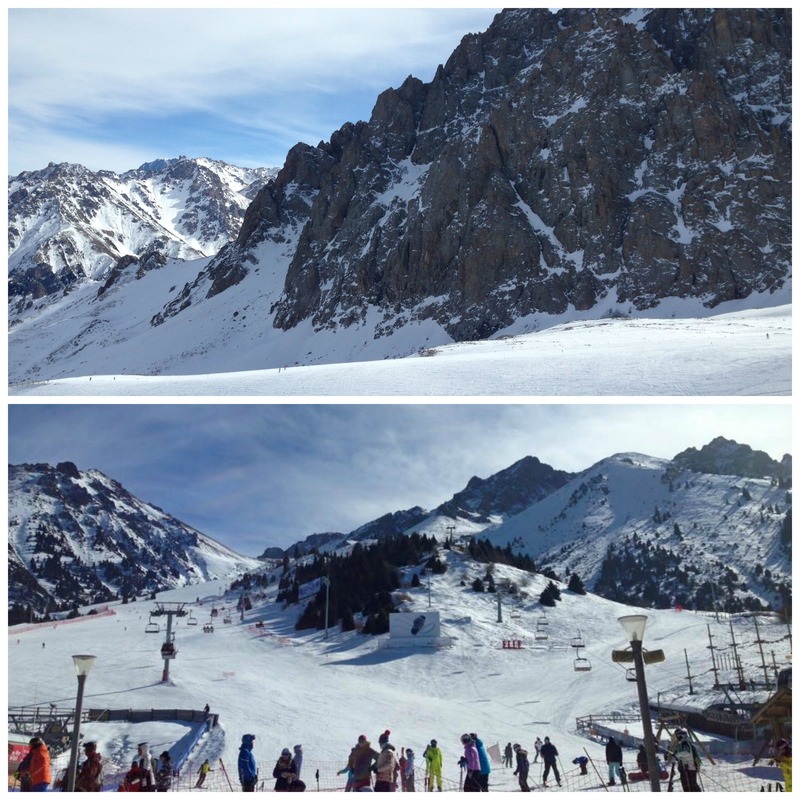 The ski area was really beautiful. Clear air, gorgeous views, and restaurants that served a ton of food I didn’t realize I’d been missing so badly. The Shymbulak Resort itself was basic. Small but clean rooms with basic amenities. I didn’t really mind though since my point of being there wasn’t to sit in the room all day. My point was to ski. I only learned to ski a few years ago when Sean pretty much said “if you want to be my girlfriend you will learn to ski” and I apparently liked him enough to willingly fling myself down a mountain with boards strapped to my feet by means of uncomfortable shoes. After six years I’m still not a good skier by any means, but I have figured out that if I make wide sweeping turns I won’t pick up enough speed to really scare or endanger myself. 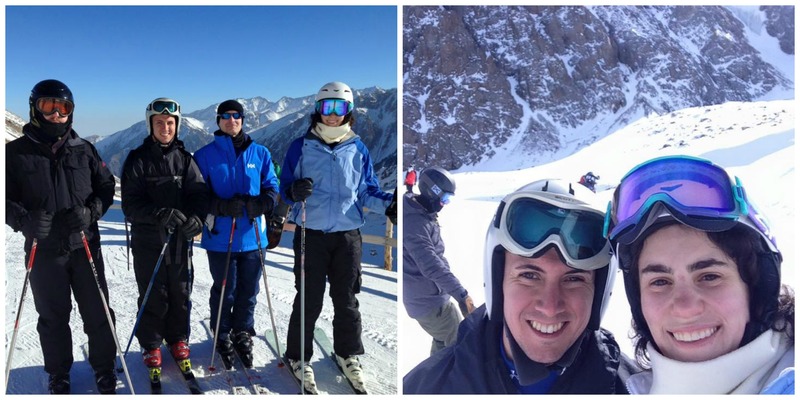 My attitude has always been “anything you can do I can do too” when it comes to skiing with Sean. Not better, of course, as it would be completely stupid to believe I could fully keep pace with someone who ski raced for much of his life. In the flatlands of the Midwest though, I could keep up with him relatively well. Even in West Virginia at Snowshoe (previously the largest thing I’ve ever skied on) I manged to stay with him on the double black backside of the mountain. At Shymbulak, I had no such luck. Top to bottom the ski-able area was a 3,000 foot differential. It also didn’t help that the peak was at 10,000 feet and I was definitely not used to the altitude. I did manage one run from the peak down relatively well (I won’t tell you I fell on the flattest part and couldn’t put my boot back in my ski for a solid 10 minutes), but I quickly realized I truly belonged on the green runs. Or at SNeG (Russian for snow), the restaurant halfway up the mountain with the best mulled wine I’ve ever had. 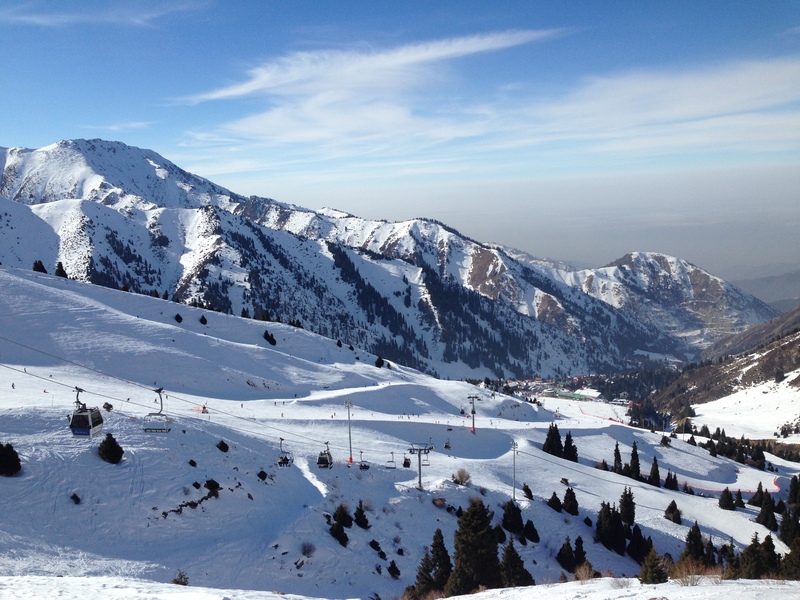 The thing about Almaty was as much as it differs from Dushanbe, it was also exactly the same. Sure there were skyscrapers, and drivers who (mostly) stayed in their lanes, and a grocery store that sold Philadelphia Cream Cheese, but on our last night it hit home that we were still in Central Asia. We went out to Hard Rock Cafe for some full-blown American food, and for the first time were hit with the usual “yeah, it’s on the menu, but we don’t have it.” A little irksome thing that happens frequently in Dushanbe is not something I wanted to deal with on vacation. And yes the grocery store was huge and had lots more variety, but it was also just a lot more of the same juice, the same chips, the same sausage, and the same tasteless pale yellow cheese. In the end though, the trip served it’s purpose. 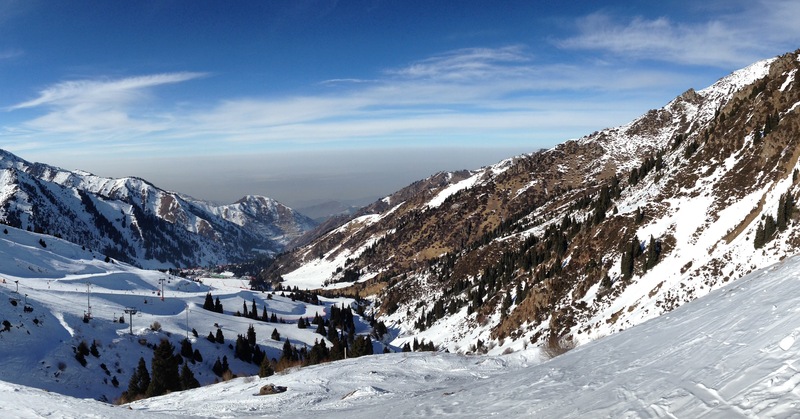 I got out of the city, into the mountains, and enjoyed a much-needed weekend away from Dushanbe. WOW, love these pictures, the weather looks like it was perfect also. lovely pics. interesting comment on the Grocery Stores reflects how easily small issues effect us.